We’d love your help. 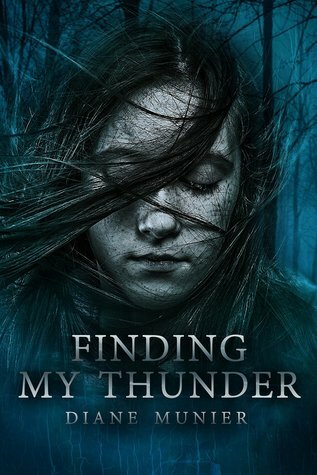 Let us know what’s wrong with this preview of Finding My Thunder by Diane Munier. To ask other readers questions about Finding My Thunder, please sign up. Diane Munier's writing and style is just gorgeous. The characters make you feel down to your marrow. You are pulled to your childhood while Diane has you crying and laughing while she fillets your heart....only fill it with a cadence of words youll remember for days and sew you up forever changed. Not enough good things to say. Full review to come. Diane Munier has cleverly managed to memorialize the late 1960’s in this powerful story of a young girl. Nearly a junior in high school, Hilly Grunier has a voice of her own. Unique, tough, and fiercely independent, she is the most compelling of her kind. We feel sorry for her and we root for her, and we question if she will make it through this dark time. There is some humor in her circumstances - smelling like iron and looking filthy in her baggy shirt. It all seems so desperate but there is a Diane Munier has cleverly managed to memorialize the late 1960’s in this powerful story of a young girl. Nearly a junior in high school, Hilly Grunier has a voice of her own. Unique, tough, and fiercely independent, she is the most compelling of her kind. We feel sorry for her and we root for her, and we question if she will make it through this dark time. There is some humor in her circumstances - smelling like iron and looking filthy in her baggy shirt. It all seems so desperate but there is a glimmer of hope on the horizon because she won’t let her mother’s ‘crazy’ in. She loves black-haired Danny with a passion - a love on pause and ready to move forward. And her drug is hope. Munier’s writing is impeccable. She has managed to crawl into the mind of a young girl so that we can see what she sees and feel what she feels. One of my favorite paragraphs sums up the essence of what this story is about. Mama . . . I wasn’t crazy and I wouldn’t let crazy in. Naomi . . . hard to look in her eyes. Eugene . . . traveling the gray between the two houses. Lonnie . . . I’d stood up to him. Robert . . . waking up the girl in me. Danny . . . blind to what was meant. And me . . . blind to myself . . . until now. This was my Vietnam. They were the frontline for my civil rights. And I was demanding. They just didn’t know it yet. They didn’t know me. I’d only met her myself. I admire Hilly for all her secrets, her trials and her sense of loyalty. She does nothing by half-measures, an all or nothing kind of girl who really gets under your skin. It’s a haunting tale that will stay with you for weeks to come. Can't stop thinking about this book. So meaningful, poignant and true. This story is alive. I think what I find most admirable is the honesty in these pages. How the author holds nothing back. What I took away from this story is that there are people in this world that think they have it all... money, cars, family, the good life. But most of us don't have all the faith, strength, integrity, character, wisdom, happiness and fulfillment that sixteen year old Hillary Grunier does. There is something Can't stop thinking about this book. There is something here in this book for everyone to take away with them. Naomi, so strong in her faith, finds her way straight to your heart and her voice stays in there, talking to you long after you've closed the pages. Hilly Grunier is the strongest female character I've ever read. The way she overcomes wave by wave of strife, opposition, sorrow and sadness and never lets it take her, but always fighting, building, growing and learning from those things, makes her the most admirable character I've ever known. The way she listens. The way she has faith. The way she fights. I connect so deeply to Hilly and Naomi that they've stayed with me for years after reading this the first time. And though this is the third time I've read this, it feels like the first time every time. This is the battle cry of Hilly Grunier, narrator and heroine of Diane Munier's sophomore novel, Finding My Thunder. As we meet Hilly, dangerous secrets swirl around her, accusations lurking in every hello and how-de-do. But Hilly doesn't fear small-town scandal or the sp "This was my heart. Hate could squeeze me, choke me, pierce me…but it could not choke the love from me…it would not. Love had to win." I really enjoyed this book. Hilly Grunier plods along in life with an alcoholic, abusive father who doesn't really seem to know she exists, and with a mother who is mentally ill. She is and has been in love with Danny Boyd for years. Danny is good for Hilly. With him she learns to be stronger than what she thought she was. She learns her family's secrets and decides to let them make her into a better person. The author did a wonderful job of creating the time period and the characters. You feel I really enjoyed this book. Hilly Grunier plods along in life with an alcoholic, abusive father who doesn't really seem to know she exists, and with a mother who is mentally ill. She is and has been in love with Danny Boyd for years. Danny is good for Hilly. With him she learns to be stronger than what she thought she was. She learns her family's secrets and decides to let them make her into a better person. The author did a wonderful job of creating the time period and the characters. You feel the tension of the time with all the racial tension, the Vietnam War, the hippies and free love. She gives you characters that are so well drawn that you can't help but hate some of them. Hilly's father was a real piece of work. I hated him from the beginning. I understood part of what shaped him, yet I could not forget the way he let his hatred of her mother and Naomi cloud his opinion of Hilly. I think I realized how strong my feelings were when he tried to get to move out of the house. This author has a way of weaving the feeling through the writing that makes it almost poetic. I will be reading and reviewing her book Me and Mom Fall For Spencer in a week and now that I've read this one I can't wait to start on it. I connected with this story in many ways. Hilly Grunier is a survivor and a fighter. She's compassionate, forgiving, and when she loves, she loves with everything she has. She grew up in a time of great change, with a mother who was too ill to take care of her and a father who didn't want to. This is the story of Hilly and Danny, the boy she has always loved. So much of Hilly's life, from the family secrets to the way of life she lived in a small southern town, mirrors my own mother's life. Diane I connected with this story in many ways. Diane makes you feel like you are living and breathing the lives of her characters. I can't wait for her next one. I didn't think it was possible to love Muniers writing any more than I did, but then I read Finding My Thunder. Hilly is a great big loving ball of wonderful! And Danny isn't so bad either. Eric and awesome! You will love some characters,and you will hate some.A great original story.Brought up so many emotions.I wish it were available in paperback! Though Hilly and Danny have grown up near each other, they seem to have drifted apart. One watches the other from a distance. Decisions by people far away and war bring them together in an unusual way. I love the way Diane writes. Her characters come alive and reek with life. Her scenes are dramatic, dialog is so outstanding. Her pacing and plotting makes her stories so unforgettable. I a Though Hilly and Danny have grown up near each other, they seem to have drifted apart. One watches the other from a distance. Decisions by people far away and war bring them together in an unusual way.